Is this the official start to spring? I think so! This was Parker's first hunt (and Lucy's first "real" one) ever, but that didn't stop them from diving in like experts. Parker was hesitant in his round and actually started helping another little girl fill her basket! He finally figured it all out during Lucy's age group and helped her fill her bag instead. No surprise, Lucy looked for as many pink eggs as she could find. I loved watching their faces light up as they filled their tote bags, and again when we got home and emptied all of our loot! This was so much fun for them and well worth the ticket price. If you're looking for a budget-friendly springtime activity--this is it! Is there anything sweeter than a snuggly baby bunny?! This was my absolute favorite part of the weekend and Preston had to talk me out of bringing one home for myself. The kids just melted over our little furry friend--Parker couldn't contain himself and spent several minutes just dancing and squealing with glee! Lucy had nothing but heart eyes and lots of "aww"s. I was surprised with how gentle they both were and impressed with the patience of all the employees handling the animals. Lucy says this was her favorite part of the festival, too, except for maybe the egg hunting! When I finally pried their little hands off those snuggly bunnies, we headed over to check out the chicks and ducklings. My kids were over the moon seeing those little yellow duckies! The duckling we held was very talkative and even gave Parker a little nibble kiss on the nose! He was so excited about it! Lucy was a little nervous and preferred to watch the chicks hanging out in their warm trough. This little feature was definitely one of the highlights of our visit--nothing says spring like sweet little baby farm animals! There are ample photo opps all over the grounds, so of course we got our bunny ears out for a quick snap! Parker is fully embracing the "cheese" these days! The Easter Bunny is available for a posed photograph in the Garden Center as well, if that's more your style. 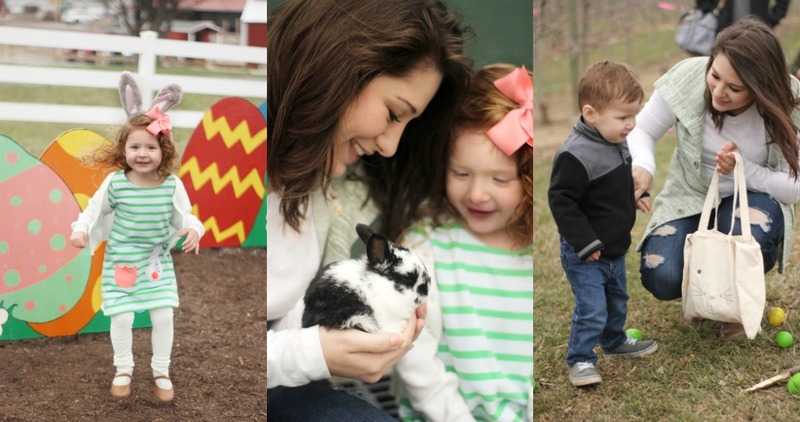 If you're looking for a fun Easter activity or just needing to get out of the house over spring break, Eckert's weekend festivals are always a hit! You can see their full calendar of events here and start planning your own visit! Your pictures are amazing ! So beautiful and happy. Makes me so look forward to easter. Can't wait! That looks so cute, my kids would love this. I need to see if anywhere does something similar in my city. oh my gosh these photos are so beautiful. I love the bunny bag and the fact that you got to play with real bunnies! What a fun day! They look all ready for Easter in their adorable outfits. The Perfect Gift That Packs a Punch!